From the outset our company’s founder Owen Robinson knew that the city of Nottingham would benefit from a provider of physiotherapy services at an affordable price, without compromising quality. Over the last 17 years he has rolled out this concept across the region without compromising on those founding principles. Here is a bit of information about Owen and his fantastic journey to becoming an experienced physiotherapist. He was born in Pretoria South Africa in 1971. Having obtained a scholarship to study at The City University in London, he completed his 4 years BSc (Hons) Degree in Physiotherapy in 1994. Following graduation he worked as a physiotherapist at the University College London hospital for 2 years. During this time he completed a Diploma in Manipulative Therapy making him a member of the Manipulative Association of Chartered physiotherapists. In 1996 Owen moved to New Zealand for 2 years, and continued to work in a private practice while also as a team physiotherapist with one of the national provincial Rugby Union teams. 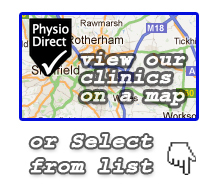 He moved to Nottingham in 1998 to start Physio Direct Sherwood Limited. Once he had established the first clinic in Sherwood he was soon to establish the company HQ (now known as Treatment House) at the Arnold Office. This still remains in the PhysioDirect portfolio of outlets to this day. He then decided to offer a service in Nottingham city centre (initially at the YMCA and subsequently Canning Circus). Having realised success at these locations he was quick to add more outlets throughout the noughties. Mansfield, Leicester, Newark and Sheffield were soon to follow and also prove to be successful. More recently Owen has decided to establish a further presence in Leicester and recently purchased ‘Imperial Physiotherapy Ltd’ and converted it to the PhysioDirect branding and livery to establish a wider network across the East Midlands. During the course of the last 10 years Owen has also worked for UK Athletics as a team principal physiotherapist and was responsible for the middle distance athletes’ care and well-being. This often required travelled with them globally to training camps and athletics meeting. For the last most recent 8 seasons Owen has also been involved with Nottingham Panthers Ice Hockey as their team physiotherapist, as well as having strong links with Nottinghamshire Police and Derbyshire Primary Care Trust. 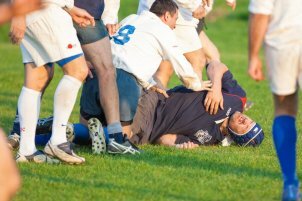 Whether you have an injury sustained whilst playing a sport, a workplace related health issue, a long-standing bad back or persistent muscular aches and pains, we can help.